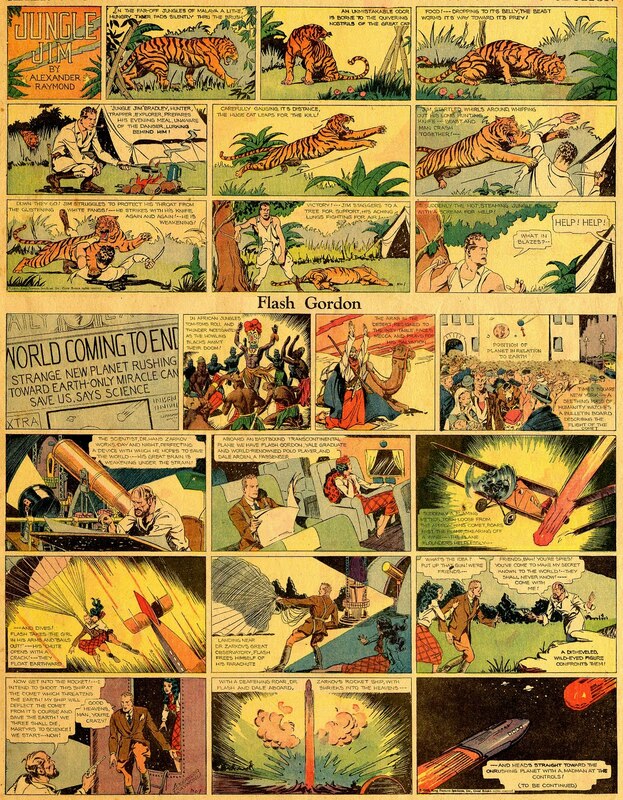 January 7, 1934 – The first Flash Gordon strip (with Jungle Jim topper). For more, check out IDW’s Flash Gordon books reprinting the early classic strips. The following is a Sunday page I put together back 1n 1999 to spotlight some of the artists who’ve worked on the Flash Gordon comic strip over the years. 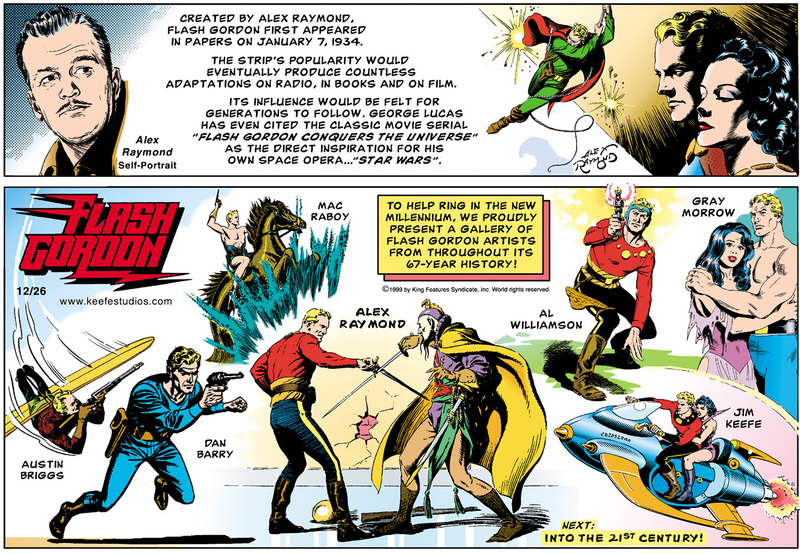 • 1934: Flash Gordon debuts as a Sunday page on January 7, 1934. 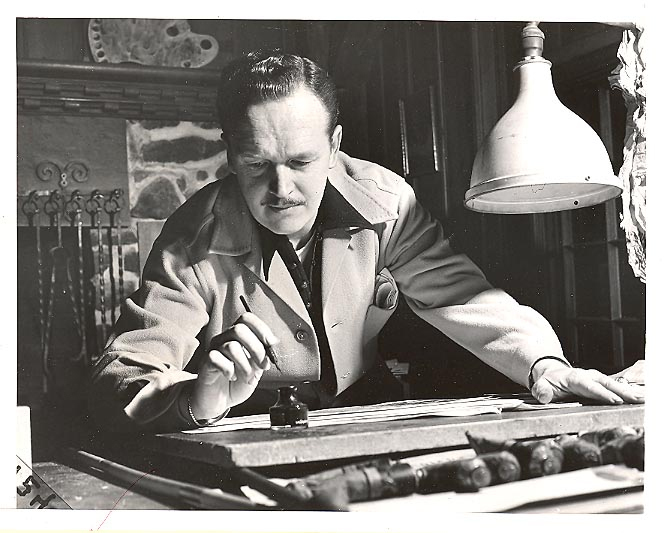 Alex Raymond is the initial writer and artist. Within the years that follow Don Moore will assist in the writing chores. • 1940: Due to Flash Gordon’s success, a daily Flash Gordon strip debuts, drawn by Austin Briggs. • 1944: Alex Raymond joins the Marine Corps. Austin Briggs drops the dailies to take over doing the Sunday page. The dailies are discontinued. When Alex Raymond returns after the war he is locked out of returning to the strip due to King’s contract with Briggs. Not wanting to lose Raymond to a rival Syndicate, King lets Raymond create a new strip with the condition that if it isn’t successful he can return to Flash Gordon. Raymond goes on to create the Reuben award winning Rip Kirby. • 1948: Mac Raboy takes over the art chores on the Sunday page. He is assisted in the 50’s by Robert Rogers. • 1951: The daily strip is resumed by Dan Barry with Harvey Kurtzman initially handling the writing chores. Dan Barry’s assistants will include among others: Al Williamson, Frank Frazetta, Fred Kida, Bob Fujitani and Harry Harrison. • 1967: Mac Raboy dies. Dan Barry assumes art chores on the Sunday page. • 1990: Dan Barry quits after argument regarding contract negotiations. The dailies and Sunday page are taken over by Bruce Jones as writer and Ralph Reese as artist. As deadlines start to be missed, artist Gray Morrow is called in to assist. • 1991: A Buenos Aires studio of artists are hired with writing alternating between Kevin Van Hook and Thomas Warkentin. • 1993: The dailies are discontinued. • 1996: Jim Keefe takes over as writer and artist of the Sunday page starting on January 21, 1996. During his tenure, Keefe will employ numerous guest artists. They will include: Brian Bilter, Mark McMurray, Loston Wallace, Michael T. Gilbert, Al Williamson, George Evans, John Romita and Joe Kubert. • 2003: Jim Keefe ends his run due to failed contract negotiations. His last original strip runs on March 16, 2003. On March 23, the strip originally intended to run as the last strip, with art assist by Patrick McDonnell, runs as a Mutts Sunday page. King begins reprinting Flash Gordon material from Keefe’s tenure to supply ongoing demand for the strip for a new online market. Pic from Mike Lynch Cartoons. • Born October 2, 1909. • Attends Iona Prep on an athletic scholarship. Gets a job on Wall Street after graduation as an order clerk. Finding himself out of work with the crash of the stock market, enrolls in the Grand Central School of Art. • Begins comic strip work as an an assistant to Russ Westover on Tillie the Toiler. Later, assists Chic Young on Blondie. • Becomes Lyman Young’s (Chic’s brother) assistant on Tim Tyler’s Luck. 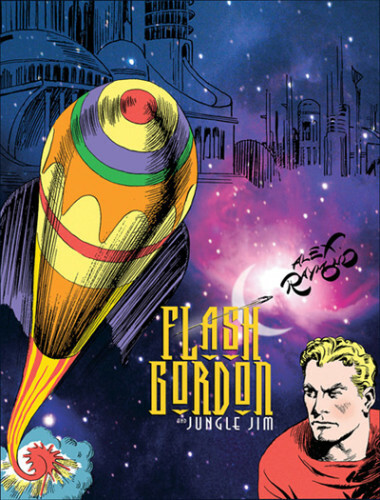 • 1934: Begins drawing Flash Gordon, along with top tier Jungle Jim. Also takes on Secret Agent X-9 – with Dashiell Hammett handling the writing chores. • 1935: Drops Secret Agent X-9. • 1944: Enlists in the Marine Corps leaving Flash Gordon to writer Don Moore and artist Austin Briggs – Briggs has already been drawing the dailies and assisting occasionally on the Sundays. • When Raymond returns after the war, locked out of continuing Flash because of King Feature’s contract with Briggs. Not wanting to lose Raymond to a rival syndicate, King gives him the oppurtunity to create a new strip and gives him the stipulation that if it fails he can return to Flash. • 1946: Raymond creates Rip Kirby. For those interested, King Features has a Flash Gordon website up. Currently they’re rereleasing strips from my tenure. And here’s a link to my retelling of Raymond’s origin story from my run. Speaking of my run on Flash, I was fortunate enough to have a lot of great guest artists over the years. Ever wonder what Flash would look like by Joe Kubert or John Romita? For more artists, check out the Flash Gordon Guest Artists web page – featuring Flash Gordon art by Al Williamson, George Evans, Michael Gilbert, Mark McMurray, Brian Bilter, Loston Wallace and Patrick McDonnell. Behind the scenes on Joe Kubert’s Flash Gordon page. Behind the scenes on Al Williamson’s Flash Gordon page. 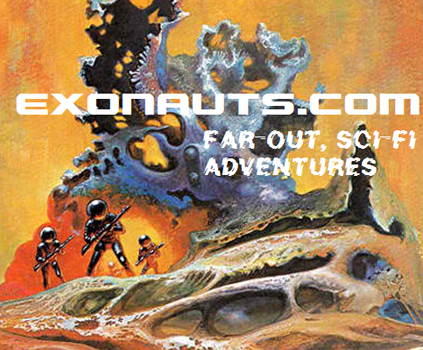 For more on Flash’s 80th, check out Exonauts, by Jay Mac. Comic Book Index – Listing of writers and artists by Jeffrey Lindenblatt. Flash Gordon Story Index in Book on Film and in Radio – by Arthur Lortie. Michael Evans’ Outer Space Cinema – Featuring classic 1930’s serials. Winner of the Silver Mark Time Award. 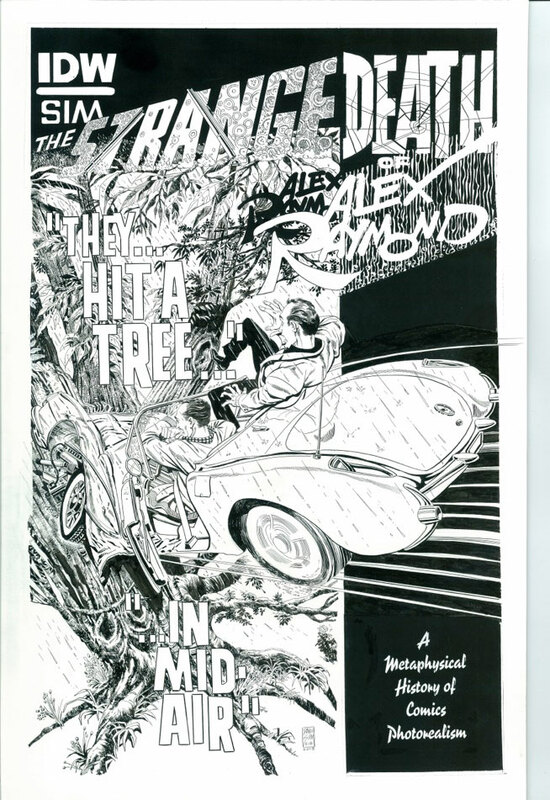 And last but not least, Dave Sim is currently working on a book dealing with Alex Raymond’s last days – more on that at A Moment of Cerebus. This entry was posted in Alex Raymod, Dave Sim, Flash Gordon and tagged Alex Raymond, Flash Gordon. Bookmark the permalink.